"The EU should mind its own business and keep its own opinions to itself," Mr Erdogan said, denying that the raids had infringed press freedom. EU leaders have said the arrests were incompatible with "European values". At least 24 journalists said to have close links with a US-based cleric are being held for plotting to seize power. Sunday's raids targeted the Zaman newspaper and Samanyolu TV channel, which are described as close to Islamic cleric Fethullah Gulen, the spiritual leader of the Hizmet movement. A former ally of Turkish President Recep Tayyip Erdogan, Mr Gulen - who lives in self-imposed exile - is accused of running a "parallel state" within Turkey. In a statement, EU foreign affairs chief Federica Mogherini and Enlargement Commissioner Johannes Hahn said any move towards membership depended on "full respect for the rule of law and fundamental rights". The raids and arrests "are incompatible with the freedom of media, which is a core principle of democracy", the pair said in a statement. But on Monday Mr Erdogan responded: "What do you [Europe] know about these operations to feel yourself competent to make such comments?" "We have no concern about what the EU might say, whether the EU accepts us as members or not." He added that the raids had been a necessary response to "dirty operations" to subvert the Turkish state. Etyen Mahcupyan, chief advisier to Turkish Prime Minister Ahmed Davutoglu, told the BBC: "We have evidence that there was wrongdoing by some people in the Gulen movement. And we have evidence that these journalists are in the Gulen movement." 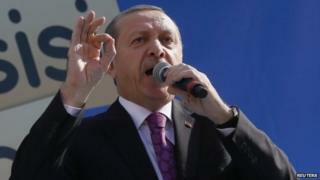 The raids come days after Mr Erdogan pledged a fresh campaign against Mr Gulen's supporters. Over the past year Mr Erdogan - whose Islamist-rooted AK Party has won three general elections since 2002 - has accused so-called "Gulenists" in police and the judiciary of using corruption inquiries to try to topple him. First expanded into Central Asia after the Soviet Union collapsed in 1991.